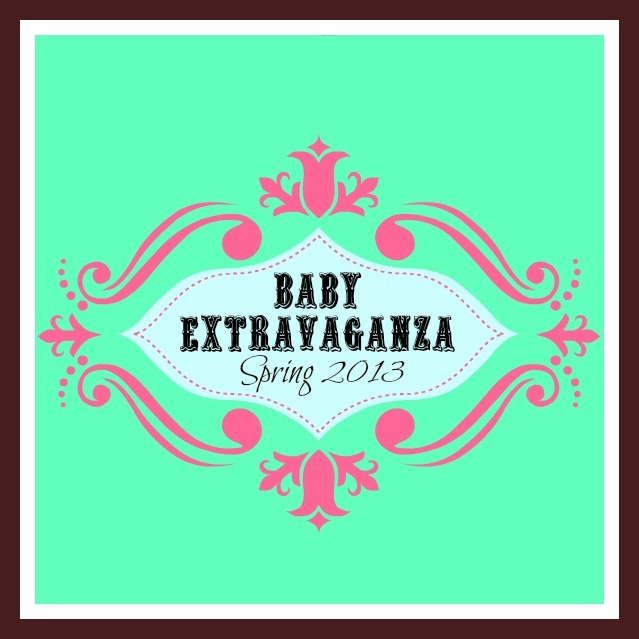 Hello and welcome to Baby Extravaganza!!! 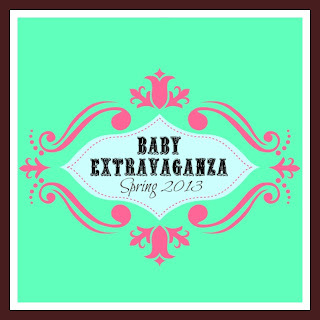 I have teamed up with Momma T and Baby E, My Four Littles, and Party of Five to bring you reviews and giveaways for all things baby.First up is Momma T and Baby E with the Boba 3G Carrier. We have this carrier and love it! I love babywearing and have been "wearing" E since she was a newborn. I knew babywearing would be a great bonding experience and also found it to be very convenient for me, especially when I need my hands free. When it comes to carriers, my favorite types are SSCs (soft structured carriers) so it might come as a surprise that I've never tried a Boba Carrier until recently. The carrier comfortably fits heights 5’0” – 6’3” and waistband range: 25” – 58”. I couldn't wait to try the Lila print Boba Carrier which features a pretty purple and gray patterned center panel and is one of the newer prints Boba carries. I was happy to learn that Boba offers several features that aren't seen on other carriers such as foot straps which attach to the waist belt and an infant conversion option which allows you to use the Boba Carrier 3G with babies over 7lbs. I appreciate that the Boba Carrier doesn't require any extra accessories such as an insert when converting to an infant carrier. I own another SSC that required an insert so I ended up having to wait until E was a few months old to use it because I didn't want to have to spend the extra money on the extra accessory. I love that the 3G design fits parents of all shapes and sizes without having to purchase an extension belt or accessory! I'm a plus sized girl so it's not a good feeling to have to buy an accessory to make a carrier fit properly. All straps are fully adjustable and elastic bands are provided so you can comfortably tuck the straps away once you have the carrier adjusted for you and your child. The adjustable sleeping hood is one of my favorite features. 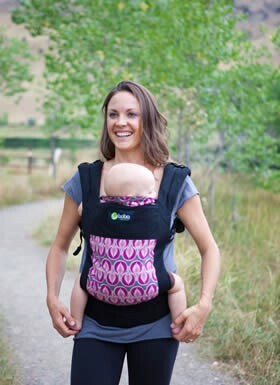 It adjusts in length to fit growing infants and the zipper pouch is great to store the hood when we're not using it. Not only is the sleeping hood great for infants, I find it very useful with my toddler as well! I prefer to back carry E (as seen above) who is now 30 pounds. I've been doing this since she was about 11 months old. It's a lot easier for me to function when she's on my back and back carrying E in the Boba 3G has been a great experience! I really like the footstraps but E is still getting used to having them there for her feet. I'm sure keeping her feet in the straps is more comfortable then allowing her feet to hang. I'm sure she will learn to keep them in the foot straps as she gets older. When it comes to comfort, The Boba Carrier feels great to wear. With other SSC's, I sometimes feel some strain in my shoulders and back but with my Boba Carrer, this is not the case at all! The Boba 3G is now my favorite out of all the the soft structured carries I have tried or have owned. I would definitely recommend the Boba to a new or even seasoned babywearer! Make sure to keep connected and informed on Boba products by following them on Facebook and Twitter! The Boba 3G carrier and other Boba carrieres and acessories can be purchased on the Boba website and you can use the store locator feature to find a retailer near you! You can also purchase Boba 3G Baby Carriers on Amazon! Boba is offering one lucky reader a Boba 3G carrier! This giveaway is open to US residents and ends March 14, 2013 at 11:59pm, EST. Disclosure: I received a product or service in exchange for my opinion. No other form of compensation was received. All opinions are mine alone and may differ from those of your own. Regardless, I only recommend products or services I use personally and believe will be good for my readers. I love the kangaroo print!